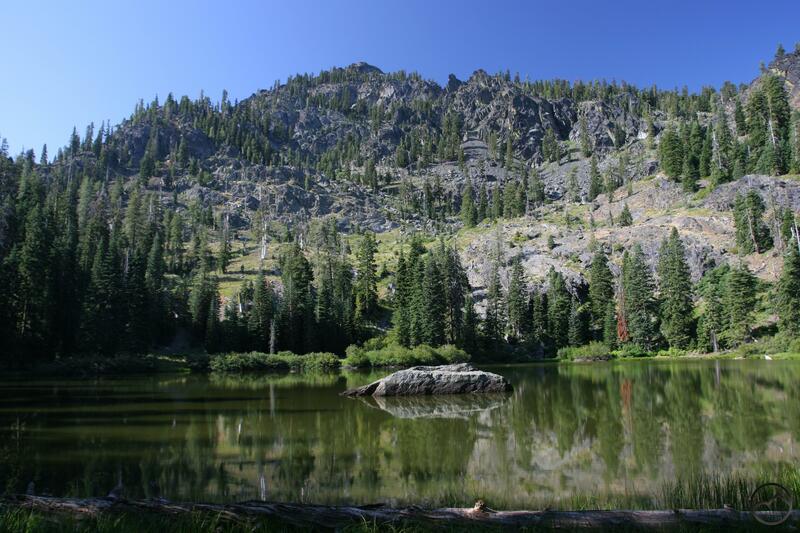 The Trinity Alps are one of the most spectacular regions in the Klamath Mountains. Hidden away in the extreme northwest corner of California, the vast Klamath Mountains are California’s least known major mountain range. While the Sierra Nevada, the Cascades, the Transverse and Peninsular Ranges and the Coast Ranges are all well known for both iconic scenery and because of their relative proximity to population centers, the Klamath Mountains are essentially lost to the public mind. For most people, the large chunk of California amounts to little more than a big blank spot on the map. Yet that which is largely unknown to most is beloved to the relative few who have the pleasure of exploring this region. Here there are great forests of incredible proportions and diversity, large rivers surging through deep canyons, razor-edge peaks towering above glittering alpine lakes and thundering waterfalls, commanding awe and admiration. In short, these are grand mountains, ranking among the finest and most beautiful in the country. The only attribute they lack is fame. Unlike most mountain ranges in California, the Klamath Mountains have somewhat amorphous borders, connecting to other mountain ranges on almost all sides as well as being bisected by the border with Oregon. Broadly speaking, the range extends east for 80 miles from the narrow margin of the Coast Range’s hills just inland from the Pacific Ocean to where the range encounters the Cascade Range. In the south, it once again abuts the Coast Range and proceeds northward over 120 miles to the Oregon border. Geologically, the Klamath Mountains continue into Oregon but north of the state line, the range is recognized more readily by one of its subranges, the Siskiyou Mountains and the Kalmiopsis Wilderness. In total, the Klamaths encompass just under 10,000 square miles, the preponderance of which lies in California. The California portion contains the highest and most rugged terrain, the most dramatic mountains, the vast majority of the lakes and most of the rivers. While other major mountain ranges in California like the Sierra Nevada have distinct regions, they are still best known as a cohesive whole. The opposite is true of the Klamath Mountains. The range is better known by its major subranges. 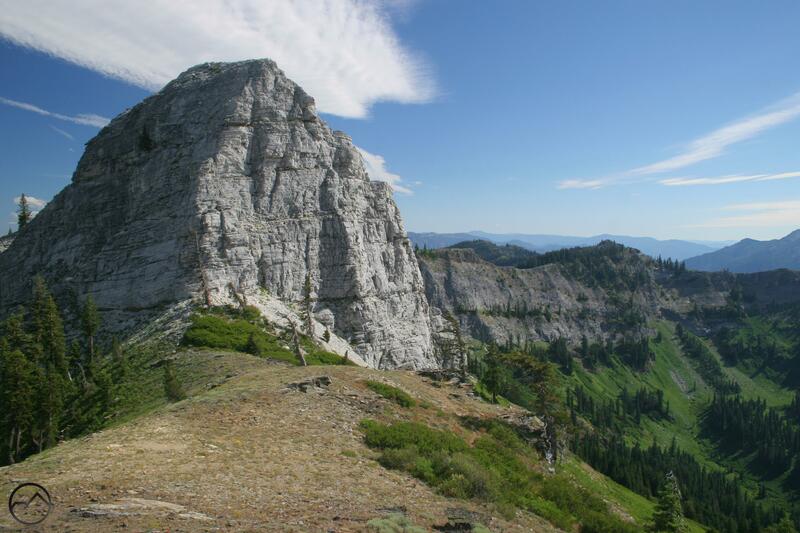 Most well-known are the Trinity Alps, the Marble Mountains and the Siskiyous. Other less well-known subranges include the Trinity Divide, the Scott Mountains, the Russian Wilderness, the North Yolla Bollys, the Trinity Mountains and the Scott Bar Mountains. There are also substantial regions that are not identified as distinct subranges. The most notable of these lies at the southern end of the Klamath Mountains, found between the North Yolla Bollys and the Trinity Alps and Trinity Mountains. Though some of these subranges are not famous or well-known, there is at least some awareness of them amongst people interested in outdoor recreation or ecology and geography. By and large, however, this area is unfamiliar to most people. The blue, purple and pink colors mark the geologic extent of the Klamath Mountains. The number of subranges in the Klamath Mountains is indicative of the exceptional geologic complexity that characterizes these mountains. Numerous, seemingly unrelated rock types are jammed together in what appears to be random patterns. Rocks from the bottom of seafloors are punctuated by great batholiths of volcanic rock while other types of marine rock swirl around in great waves the scope of which is difficult to fathom without the aid of maps. The complex geology of the Klamath Mountains is one of the two primary metrics by which the extent of the Klamath Mountains is determined. 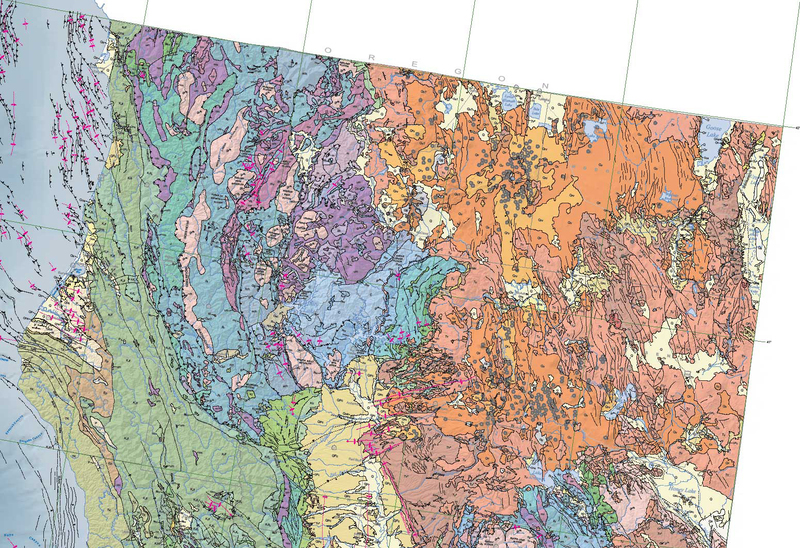 When looking at the geologic map, the range is easy to identify. The Klamaths are predominantly composed of sedimentary and ultramafic rocks with significant granite intrusions. Other types of rock like limestone and metavolcanic rocks also have notable intrusions scattered around the range. This is in sharp contrast with the recent volcanic rocks that are adjacent on the east side and the large block of marine sediment and sandstone conglomerates that form a large block of the North Coast Range to the west and south. 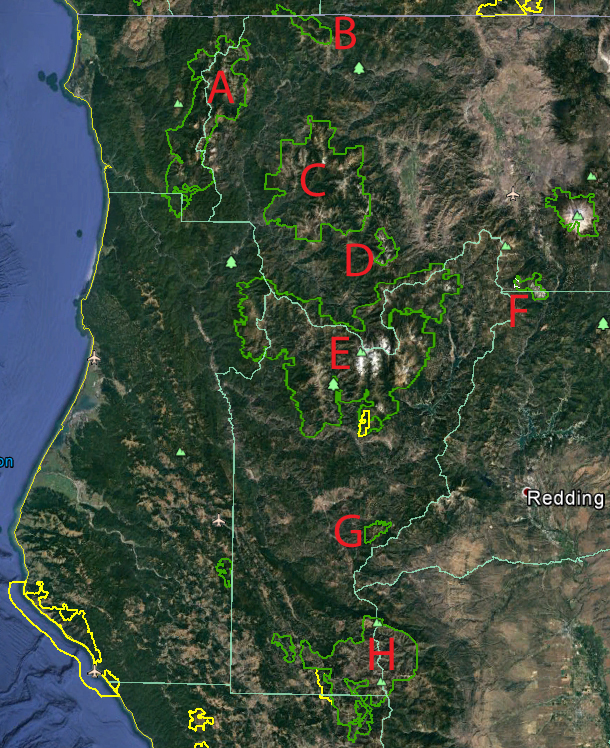 It is worth noting that the Klamath Mountains are almost geologically identical to the northern Sierra Nevada. The presence of large blocks of sedimentary and ultramafic rocks punctuated by significant intrusions of granite is typical of both regions. Looking at the Geologic Map of California, it appears that the Klamaths were once part of the Sierra Nevada but were wrenched away from the main range, cut off by major volcanic flows from the Cascades or both. Either way, the regions closely resemble each other and hikers who are familiar with both often comment on the striking similarities. A third region, the Blue Mountains of eastern Oregon also seem to be composed in a similar fashion, leading some to speculate that these mountains were also part of same cordillera. The other distinct element of the Klamath Mountains, particularly in the California section of the mountains, is the rivers that course through the range. Amazingly, the watersheds of these rivers align almost perfectly with the geologic borders. Several large mountain rivers are found here. Chief among them is the Klamath River, from which the range gets its name. This large river’s headwaters are located in central Oregon, where the Sprague, Williamson and Sycan Rivers all flow southward and join around Upper Klamath Lake, where the Klamath River itself begins. The river then flows through the Klamath Basin and the Cascade Range before passing just north of the Shasta Valley. Beyond the valley, the river enters the Klamath Mountains province. While already a large river, it is here that it begins to gather the waters of the numerous rivers that arise in the mountains of the Klamaths. First to join is the Shasta River, followed by the Scott, Salmon and Trinity Rivers. This last is a large, long and mighty river in its own right and drains the almost the entire southern half of the Klamath’s California portion. Major creeks, including Clear, Wooley, Gridder, Canyon and Hayfork Creeks all have significant watersheds of their own. The watersheds of these rivers all correspond to the geologic extent of the range. Equally amazing, with the notable exception of the dam that forms Trinity Lake, all of these rivers are undammed and wild as they flow through the Klamaths (three dams are found on the Klamath River as it passes through the Cascades but none lie downstream). 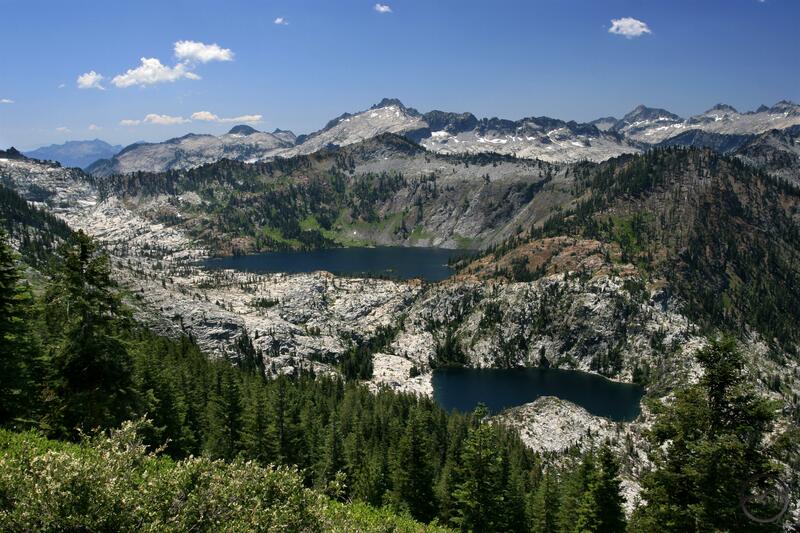 The Trinity Alps boast vast alpine expanses. In keeping with the forgotten nature of the Klamath Mountains, it is also one of the wildest regions of California. There roughly 1,000,000 acres of wilderness in the California section of the Klamaths, making it the second largest alpine wilderness block in the state. Only the Sierra Nevada has more montane wilderness. 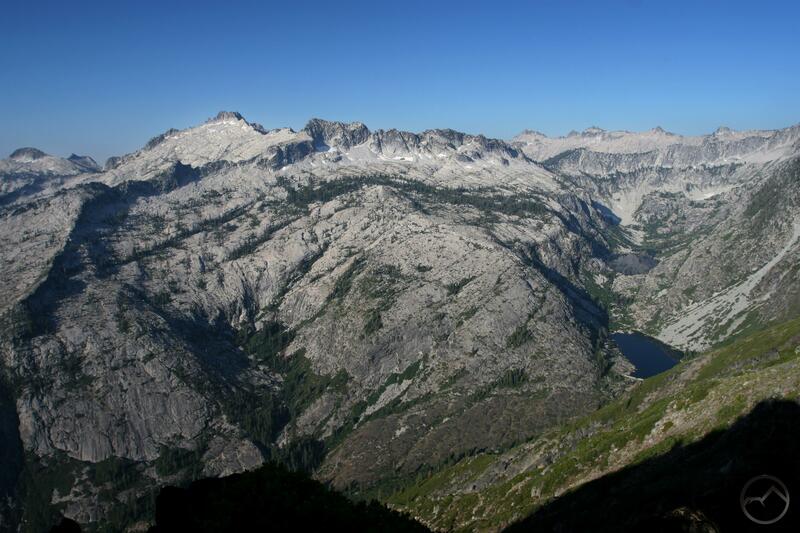 The most notable wildlands in this part of the Golden State is the massive Trinity Alps Wilderness. Boasting and amazing 537,363 acres, it is one of the largest wilderness areas in California and the second largest administered by the U.S. Forest Service (after the magnificent John Muir Wilderness, which encompasses 652,790 spectacular acres). The large block of wildlands is complemented by low regional population and significant distance from population centers. Consequently, much of this area is wild with a capital “W”. There are 7 wilderness areas entirely within the Klamath Mountains. 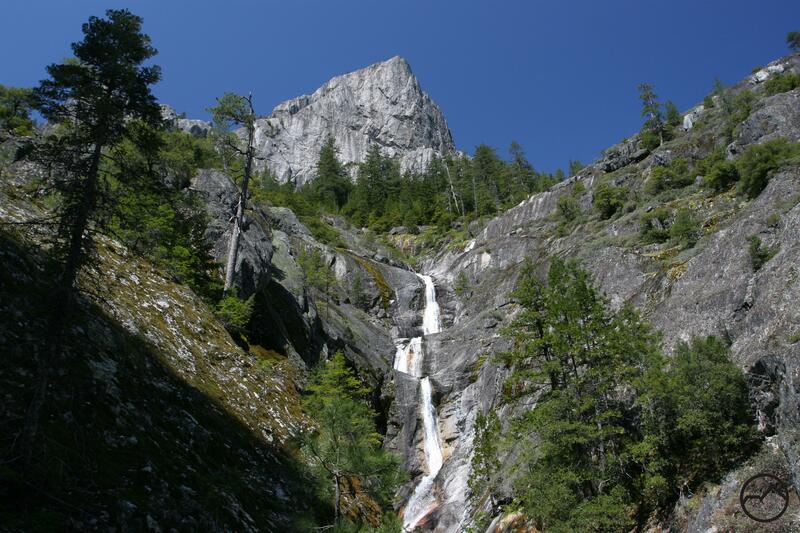 As mentioned previously, the northern portion of the Yolla Bolly-Middle Eel Wilderness falls within the Klamath province, bringing the total up to 8. Most of the acreage is focused on the 3 largest areas, the Trinity Alps, the Marble Mountain and the Siskiyou Wilderness areas. Four more, smaller areas are scattered around the range. While there are notable exceptions (Mount Eddy, Scott Mountains), most of the best scenery and recreational opportunities fall within the boundaries of these wild areas. In some cases, these wilderness areas correspond to the major subranges within the Klamath Mountains but for the most part they are only taking in isolated portions of larger geologic blocks. 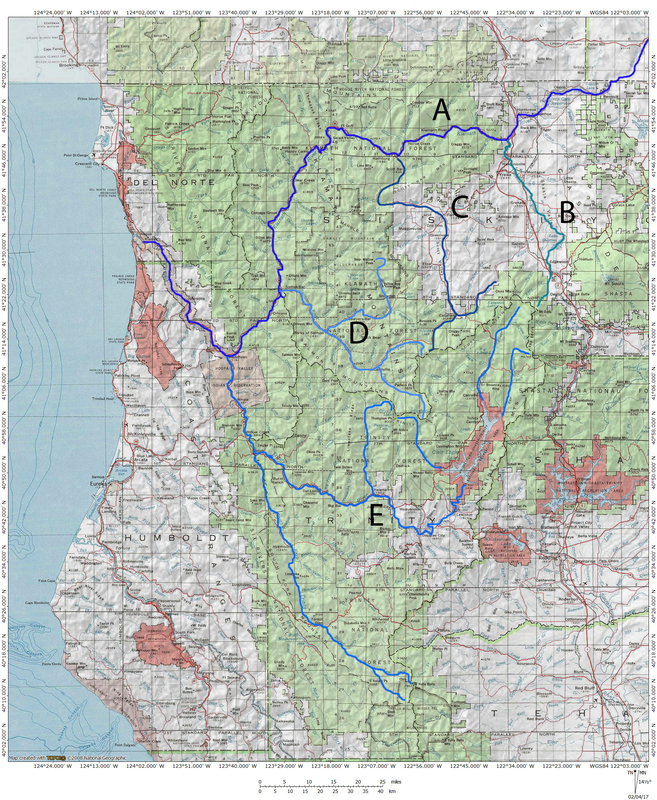 The scale of the areas ranges from over half a million acres in the Trinity Alps to the tiny Chanchelulla Wilderness, which has less than 10,000 acres. The heart of the Klamaths is dominated by the Trinity Alps, Russian and Marble Mountains Wilderness areas. These three wildlands form a nearly contiguous nucleus that accounts for 75% of the protected wilderness in the Klamath Mountains. Fall at the Devils Punchbowl. 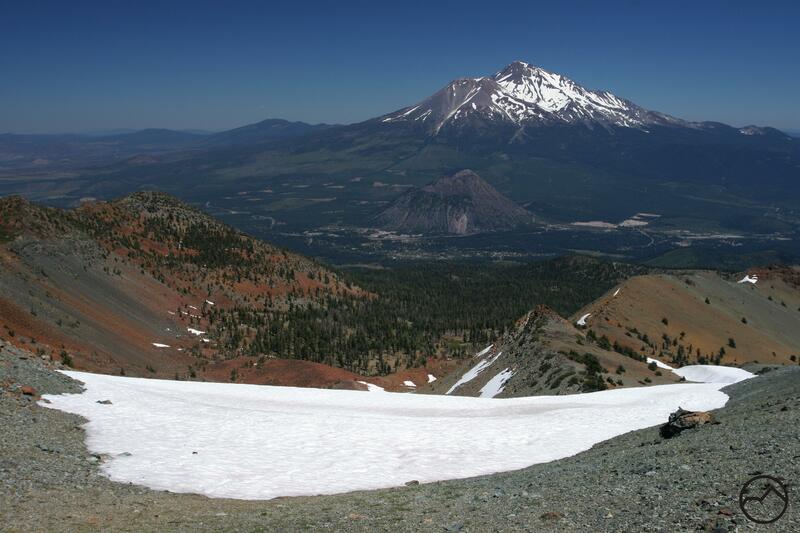 The largest block of wilderness in the Siskiyou Mountains, the 179,847 acres of the Siskiyou Wilderness contain a beautiful collection of alpine lakes and rugged peaks. Located at the southern end of the long crescent of the Siskiyous that runs from Interstate 5 in the northeast to the confluence of the Klamath and Trinity Rivers in the southwest, the Siskyou Wilderness is easily the most rugged stretch of mountains in the entire range. The wilderness is dominated by spectacular Preston Peak, which looms 1,000 feet or more above any mountain within a 20 mile radius. Though not as tall, other peaks, including Bear Mountain, El Capitan, The Lieutenants, and Black Butte also provide rugged interest to the range’s skyline. The principle watershed within the Siskiyou Wilderness is Clear Creek. Fed by several alpine lakes and meadows, this large waterway rises at the north end of the wilderness and flows 25 miles to the southeast, where it meets the Klamath River. Numerous trails provide access to the interior of the wilderness. The most popular trails generally lead to lakes, the most notable of which is the awesome Devils Punchbowl. Figurehead Mountain in the Red Buttes Wilderness. One of the smaller wilderness areas in the Klamath Mountains, the Red Buttes Wilderness encompasses 20,133 acres, of which 16,356 are within California, the rest falling just north of the Oregon border. The name comes from twin towers of the Red Buttes, the highest and most interesting peaks in the wilderness. Like much of the wilderness, the buttes lie along the crest of the Siskiyous. The north side of the mountains drain into the Rogue River via the Applegate River. On the south the water makes its way into the Klamath River. 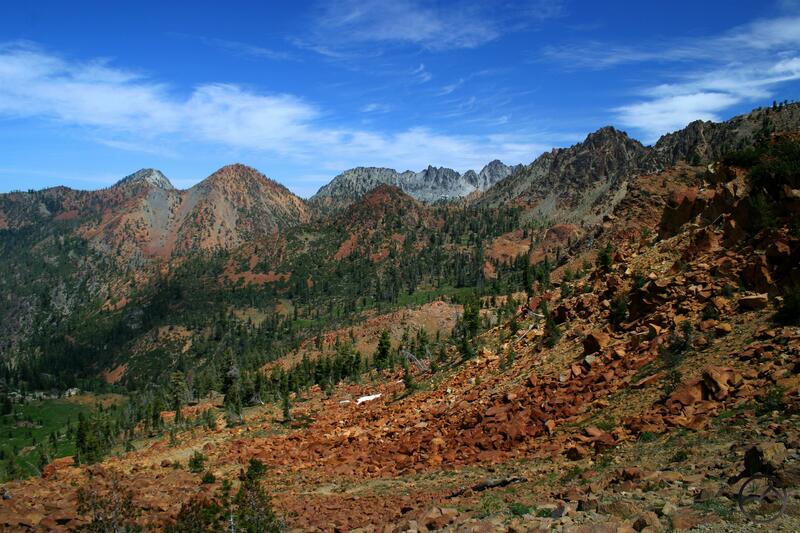 Much of the wilderness is composed of sedimentary rock but the Red Buttes themselves are part of an isolated block of ultramafic rock, one of the major rock types present in the Klamath Mountains. A few small lakes are found throughout the wilderness, Azalea Lake being one of the prettiest and most popular. Access to the Red Buttes Wilderness is best coming south from Oregon. The Pacific Crest Trail’s steep climb out of Seiad Valley is the only good access from the California side. Divided between the watersheds of three of the Klamath Mountains’ major rivers, the Marble Mountains are the second largest wilderness area in the Klamaths. This incredible 225,114 acre wildland feeds water into the Klamath, Salmon and Scott Rivers. The creeks that flow into the rivers originate in the dozens of alpine lakes scattered around the wilderness. Many of the lakes are large, deep and set in heavily glaciated cirque basins. Indeed, the lakes of the Marble Mountains are one of the star attractions for hikers. Several prominent peaks also dot the landscape. The most memorable being the wilderness area’s namesake, the Marble Mountain. One of the more unique mountains in the west, the stark white marble of this unusual mountain stands out against the green forests and meadows and the ruddy peaks that surround it. Trail access to the Marble Mountains is excellent. Numerous trailheads on all sides of the wilderness create numerous hiking and backpacking opportunities. The diminutive Russian Wilderness occupies the easternmost fringe of the unsung Salmon Mountains. While it may be small in stature it is not small on scenery and ranks among the most beautiful in the Klamath Mountains. Composed almost entirely of granite, the Russian Wilderness occupies the highest part of the Salmon Mountains and forms the divide between the Salmon River and the Scott River. In terms of wilderness preservation, this primeval land forms a bridge between the massive Marble Mountains and Trinity Alps Wilderness Areas. 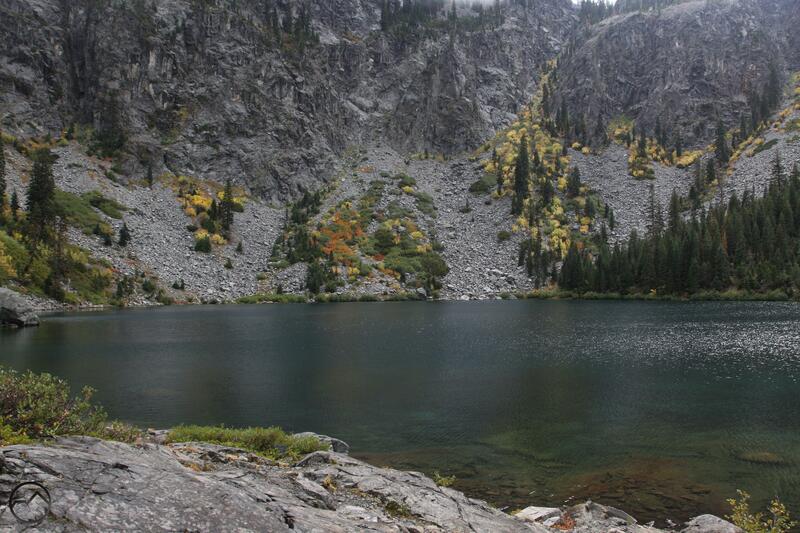 Granite basins are found on both sides of the crest and are home to several large, beautiful alpine lakes. Most of these are accessed by a good network of trails which includes several miles of the Pacific Crest Trail. The wilderness takes its name from Russian Peak, the highest point in the Salmon Mountains and among the highest in the Klamath Mountains. Rugged mountains of the Trinity Alps. In many ways the vast Trinity Alps Wilderness is the heart of the Klamath Mountains. While they are located near the center of the California part of the Klamaths, it is the scale of the mountains, lakes, canyons and waterfalls within the wilderness that places them at the apex of this large mountain range. Here is the most spectacular scenery, where granite towers soar thousands of feet above deep canyons, where thundering waterfalls pound against the unyielding stone and large, deep alpine lakes glitter in massive glacial cirques. The scale of the mountains and scenery is only matched by the scale of the wilderness area that protects it. It is only in the Trinity Alps that hikers and backpackers get the since of magnitude that is found amidst the great spires of the Sierra Nevada. It is here where the vastness is felt with every step. 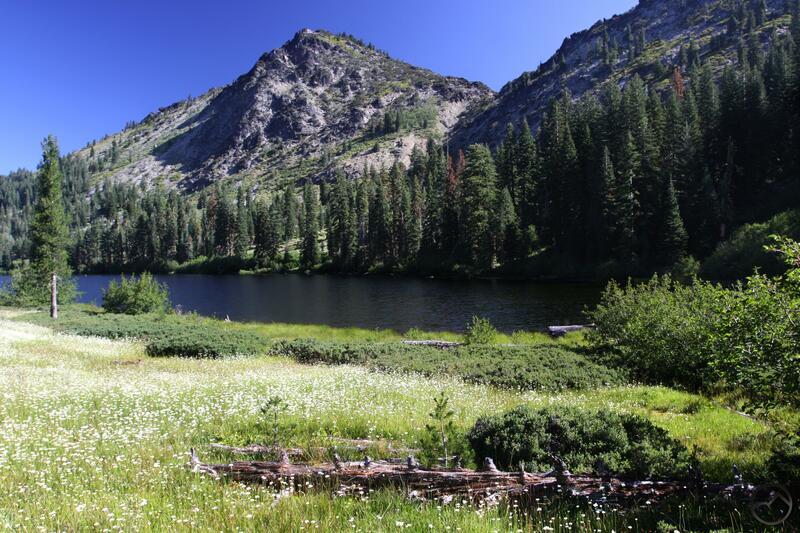 For hikers, the attractions of the Trinity Alps are legion. Fortunately an excellent trail system offers countless trip possibilities. Trips of a week or two in length are easily feasible in this awesome wilderness. While the core of the Trinity Alps falls in the Trinities proper, portions of other Klamath Mountains subranges are included within the wilderness boundary. This notably includes the southern stretch of the Salmon Mountains and the entire western half of the Scott Mountains. Consequently, the Trinity Alps Wilderness contains the headwaters of many forks of the Trinity River as well as the South Forks of the Salmon and Scott Rivers. Root Creek Falls and Castle Dome. Covering much of a central rib of the Trinity Divide, the small 10,609 acre Castle Crags Wilderness is epic in terms of scenic qualities. The obvious centerpiece of the wilderness is the chaotic jumble of granite spires that makes up the Castle Crags. The crags are a major granite pluton that has intruded into the sea of ultramafic rock that makes up the Trinity Divide. Polished by glaciers, the Crags are favorably to parts of the Sierra Nevada in terms of appearance. However, the wilderness area is not limited to the Castle Crags alone. The western part of the wilderness includes a cluster of high peaks and all or part of two alpine lake basins. The Gray Rock Lakes are set in a deep valley over 1,000 feet below a pair of rugged summits. A little to the west, the wilderness area includes the higher reaches of the Castle Lake basin, including vista-rich Heart Lake and beautiful Little Castle Lake. The lake basins are accessed by good trails but the Castle Crags themselves are wilderness in the truest sense of the world, unpenetrated by trails and the domain of the hearty souls who scramble the steep slopes in order to scale the magnificent cliffs. Hikers have to content themselves with enjoying the view from the Pacific Crest Trail and a few other paths that travel along the base of the Crags. 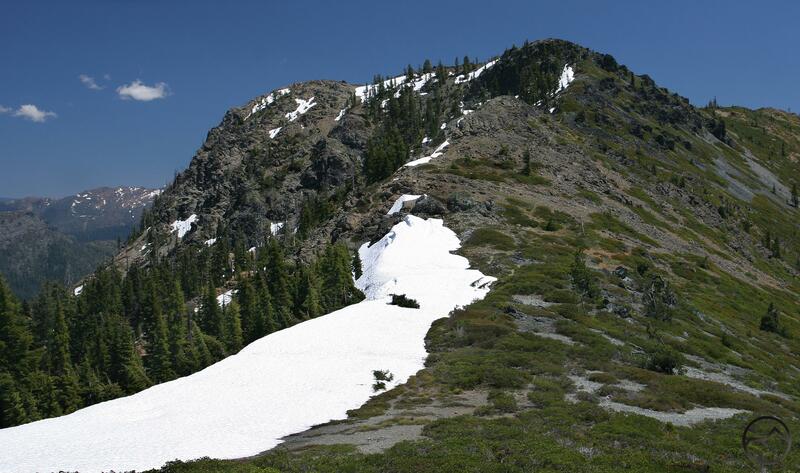 The smallest wildland in the Klamath Mountains, the Chanchelulla Wilderness is centered around its namesake peak. At only 8,062 acres, there is barely room into include Chanchelulla Peak and its lower flanks. This is also one of the least visited wilderness areas in the Klamath Mountains. Tucked away at the far southern end of the Klamaths, it is far from population centers, suffers from lack of trails and requires a long and bumpy drive to get to Deer Lick Springs, the only good access point. Nonetheless, for those seeking a truly wild and remote experience, this is a good place to explore. Block Rock Mountain and Black Rock Lake. Most of the 182,299 acres of the Yolla Bolly-Middle Eel Wilderness protects a large swath of the North Coast Range’s highest terrain. The northernmost section of the wilderness contains the North Yolla Bolly Mountains, the southernmost set of peaks that belong to the Klamath Mountains. This collection of peaks is arguably the prettiest corner of the entire wilderness. It contains rugged peaks, sheer cliffs, huge fields of wildflowers and a pair of small but very scenic lakes. The North Yolla Bollys are also the headwaters of the South Fork of the Trinity River. This river, along with the geologic transition that takes place at the North Yolla Bollys, marks the southern end of the Klamath Mountains. Though it is remote, there is good access to the Klamath corner of the Yolla Bolly-Middle Eel Wilderness. A well-maintained trail system leads to all the major points of interest and beyond, into the interior of the wilderness. Part Two of the Klamath Mountains Geography will take a different approach to the Klamaths and break the entire range down by subranges. This will hopefully bring further clarity to this mysterious mountain region. What a great post! The maps are amazing! And I am one of the few that you mentioned. Are the numbers really that small? I thought hikers in some spots off 299 were in record numbers. I really appreciate the way you set up the post as a discussion of the Klamath Mountains, and the sub-categories that have their own characteristics. My favourites are the Marble Mountains, the Russian Wilderness, and the Trinity Alps…but I think that’s because those are the ones I’ve seen! As soon as I hike the other places, I’m sure I’ll be able to add them to my favourites.